Al Masaood Commercial Vehicles & Equipment (CV&E) Division, part of Al Masaood, is participating for the first time in the World Future Energy Summit (WFES) – Eco-Waste Exhibition in Abu Dhabi. The WFES Eco-Waste, being held from January 14 to 17 at Abu Dhabi National Exhibition Centre (Adnec), is dedicated to advancing sustainable waste management and recycling solutions in the region and will showcase the latest technologies, debate challenges that await and pinpoint the opportunities and solutions that will transform attitudes and behaviors around waste in the future. 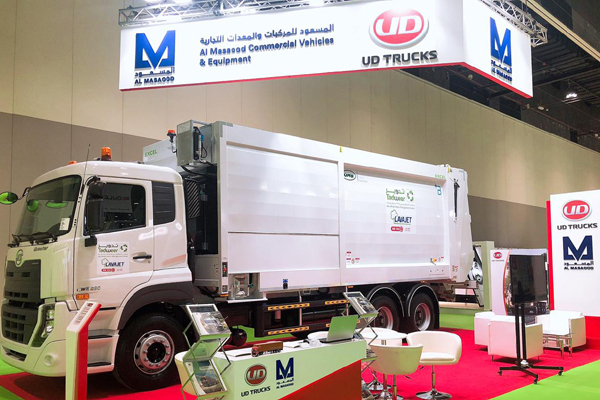 As the sole distributor of UD Trucks, Al Masaood CV&E Division is showcasing the Quester UD truck at the exhibition, which is a new generation of heavy-duty trucks, launched in 2016 in the region and used for waste management purposes.